The saltiness and creaminess of peanut butter works really well combined with the sweetness of baked goods and is a flavour combination I have recently rediscovered. It works exceptionally well with chocolate, but then I would say that wouldn’t I. When I was reviewing The Cookie Dough Lover’s Cookbook earlier this month, I noted a recipe for peanut butter and chocolate thumbprint cookies which looked appealing. With my birthday tea fast approaching, I thought these would provide something a little different and would fill in the gaps between the slabs of cake. When it actually came to making the cookies, I decided not to include the chocolate cookie dough thumbprint filling. To me it seemed as though they would be sweet enough without and more to the point, I was running out of time. Measuring cups of butter and peanut butter is not really on, so I did the best I could in terms of approximations. Creamed 1/2 a jar of smooth peanut butter (about 170g) with 2oz (60g) unsalted butter. Added 1/2 cup caster sugar and 1/2 cup of light muscovado and creamed some more. When light & fluffy beat in 1 duck egg (large hens egg) and 1 tsp vanilla extract. Sifted in 1 1/4 cups flour (half wholemeal & half white) with 1 tsp baking powder and stirred until incorporated. Poured 1/4 cup of sugar into a bowl. Rolled tablespoons of dough in my hands to form large walnut sized pieces. Rolled these in the sugar and placed onto two lined baking trays, leaving a 3 cm gap between them. Flattened them slightly with a spoon. Baked in the middle of the oven at 180C for 12 minutes (until golden and firm). Melted 50g dark chocolate (G&B Cook’s 72%) in a bowl over hot water. Ineptly drizzled this over the cookies in a zig zag kind of motion using a cone made out of greaseproof paper. These made about 32 very substantial cookies. Despite my ineptitude with the melted chocolate and paper cones, more of which covered the kitchen than the cookies, I was rather pleased with the results. They were sweet, salty and delicious and not surprisingly, proved to be very popular. These would make excellent bake fare for a summer fete or cake stall, so I am submitting them to Tea Time Treats hosted this month by Karen of Lavender and Lovage. This monthly event is run alternately by Karen and Kate of What Kate Baked. Wow looks delicious and yummy! Yes, yum indeed. Just as well they were made for a party & not for home consumption! These look so cute and it sounds like they taste really good! I love cookies with pretty presentation. Thanks Johanna – really there isn’t a very practical way of measuring things like nut butters, other than by spoonfuls I guess. Waw! Your home-made cookies look utterly delicious! Oooh my they look super! Very nice indeed. Thanks WLM. Too nice and it’s a problem. I’m sorely tempted to make them again and not for a party either! It’s true! Peanut butter and chocolate are an amazing combination! I love the sugar coating, Choc! Thanks Celia. The sugar coating added to the general appeal and also gave an additional crunch to the texture, definitely better with I think. Mmm…very enticing. Love the peanut butter/chocolate combo. Thanks Angela – it’s a good one and very popular it seems. I’ve never tried to combine chocolate and peanut butter, it sounds delicious! I’m not familiar with peanut butter and now I feel inspired to try. Rita I grew up with peanut butter sandwiches, but I didn’t think to use it in baking for many years. It works really well for many people, though not everyone likes it. I never liked peanut butter until about 10 years ago, I always associated it with Sunpat which would still turn my stomach. Later I tried organic crunchy peanut butter made with sea salt and oil which was delicious – last week I ventured for the first time to buy organic smooth paste as there seem to be so many cookie recipes that use it. These cookies look like the perfect place to start! The thing is Karen, if you don’t like peanut butter, there is all the more for us 😉 I know what you mean though, I can’t quite understand why everyone raves about coffee so much. They look delicious, I love peanut butter cookies but haven’t made any with chocolate yet and am definitely going to give these a go. Love these cookies look amazing and yumm!! They look very tasty. I also like peanut butter in cookies. The chocolate drizzle just finishes them off nicely. My Pop (grandfather) always used to make peanut cookies. Since he died, aged 92 in November, my 15 year old Son has been missing him and his baking, (Pop kept cooking until only a couple of months before he passed away) and so now my Son has started cooking them himself, carrying on the family tradition. Yum they look delicious! I don’t really know why but I hated peanut butter as a kid… let’s just say I’m making up for lost time now. I think these cookies could help. And a duck egg? wow! My favourite cookie of all time are PB choc chip, so these would be right up my street. Peanut butter and chocolate is one of my all time favourite combinations, they are perfect for each other. I wouldn’t say your drizzling was inept, it actually looks rather artistic! 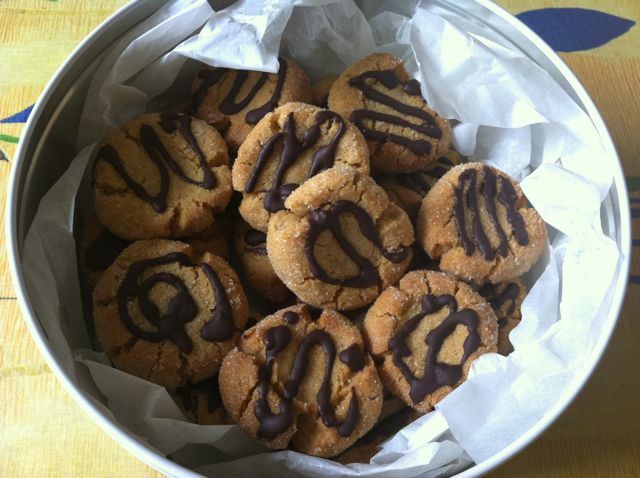 They look lovely and the chocolate and PB combination is always a winner! I love the way you’ve drizzled them with chocolate too!